Some things you take for granted and just get used to. 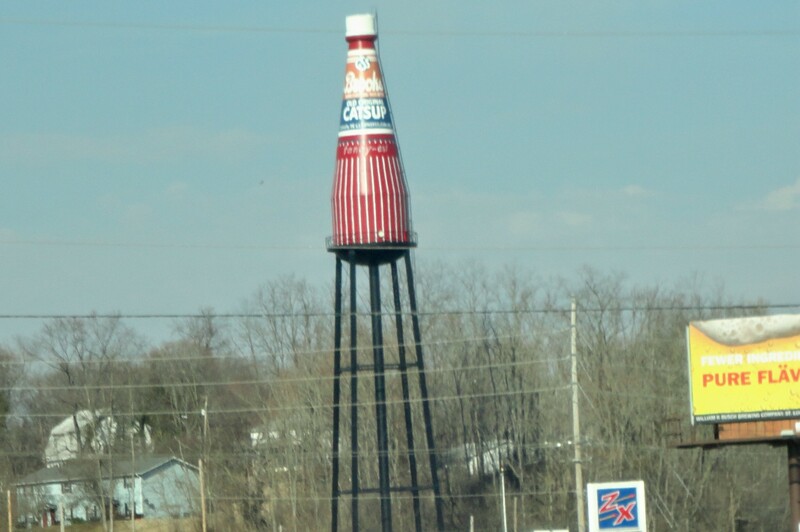 That is the way it is with the world’s largest catsup bottle that sits high above the sky, a cherry red water tower dominating the landscape. You get so used to seeing it as you drive by you forget this really is an iconic symbol that even is the topic of its own festival! What is this symbol that sits next to Route 159? Stamdomg 170 ft. tall the water tower was built in 1949 by the W.E. Caldwell Company for the G.S. Suppiger catsup bottling plant – bottlers of Brooks old original rich & tangy catsup. The tower was saved in 1995, due to the efforts of the Catsup Bottle Preservation Group, from demolition and beautifully restored to its original appearance. The 15th Annual Brooks® World’s Largest Catsup Bottle® Festival Birthday Party & Car Show will be held Sunday, July 7, 2013, from 10:00 am to 5:00 pm on the grounds of American Legion Post 365 (1022 Vandalia on Route 159) in Collinsville, Illinois. Take a gander next time you drive through Collinsville and give a nod! Previous Post: Nickorbobs Craft Mall- Think Spring! Next Post: Toys, tractors and Trucks Oh, Sublette Toy Show Here We come!